Welcome to the Thuringian Forest. 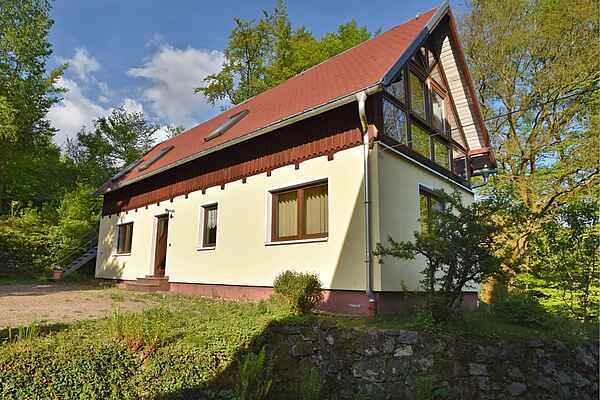 Right at the edge of the forest at Zella-Mehlis, you will find this detached holiday home. The house is solely inhabited by you and consists of 2 floors. The house is bright and comfortably furnished. You can access the upper floor with a large and comfortable living room via a spiral staircase. A fully equipped kitchen and a modern bathroom with tub leave nothing to be desired. A small garden with outdoor furniture and barbecue round off the amenities on offer. The neighbouring building, the former forester's lodge, has a small sauna you are free to use if you want. The famous Rennsteig is only 6 km away. The attractive location has everything you need for a calm, relaxing and sophisticated holiday. The town centre is just a few hundred metres away. Many half-timbered houses, crooked streets, the beautiful old baroque church, the museum of local history and the drop forge all tell the story of the town's past. The open-air swimming pool is within walking distance (approx. 8 minutes). There are plenty of excursion destinations, such as Suhl (8km), Meiningen (25km), Oberhof winter sports centre (10km), Erfurt (55km) or Weimar (75km).